His injuries were minor. The school bus driver was cited after the crash, FHP troopers said. 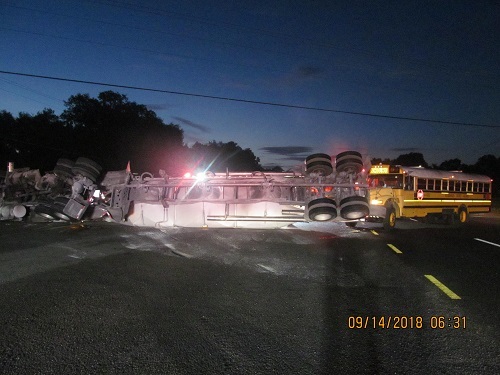 HILLSBOROUGH COUNTY – An 8-year-old pupil suffered minor injuries and a tractor-trailer overturned in a crash with a Hillsborough school bus this morning (Sept. 14), according to the Florida Highway Patrol. The boy was taken to an area hospital for treatment. There were no other injuries in the crash. Phyllis Ann Meachum, 72, of Plant City, the school bus driver, was cited for violating the right of way. The crash happened about 6:10 a.m. at the intersection of State Road 60 and Horton Road in Hillsborough County. Troopers said Meachum, who was driving a 2004 bus, was northbound on Horton. She had stopped at the SR 60 intersection before entering the intersection and the eastbound right lane. Benjamin Garcia Alfonso, 42, of Tampa was driving a 2004 semi tractor-trailer east on SR 60. When the bus turned in front of him, troopers said, Alfonso tried to avoid a collision by steering left, but lost control. 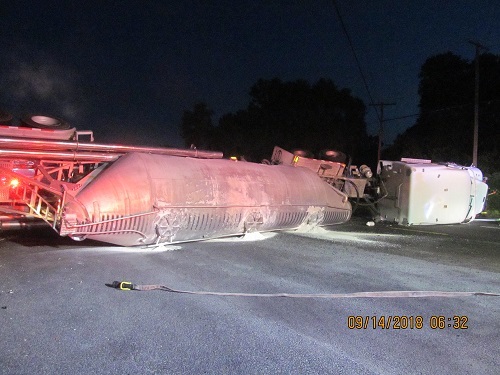 The tractor-trailer, which was hauling lime rock, overturned across the roadway and the trailer portion hit the front of the school bus. Johanes Dwelley, 31, of Mulberry, who was driving a 2016 Toyota Corolla west on SR 60 also tried to avoid a collision by steering to the outside shoulder. Traveling on the shoulder damaged the Toyota, troopers said.